I am never good at managing my daily use accessories. Whenever I leave for the office my wife is the one who always provides me with the car keys, and my office cabinet keys. I am very bad in keeping them safe. I always forget where I had placed the keys last time when I got back from the market, but now this matter is resolved with the help of pallet key rack shelf. 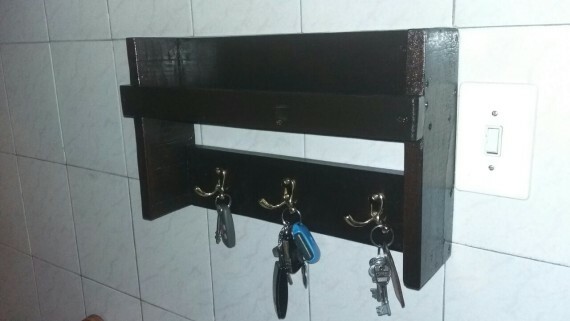 I am no more in trouble of finding my keys instantly, because this wooden pallet key rack is there to help me. Being a well organized and disciplined person solves many of your fore coming problems certainly. But I am not at all that type of guy. My life is literally always messed up. I can not manage to keep my daily use accessories at one place and find them instantly in the hour of need. Then my wife who was literally sick of my carelessness gave me the idea of repurposing this unique key rack. And it was just like all of my problems regarding keys preservation were instantly gone. Now I feel so much relieved when I simply find all my keys on this wooden pallet recycled key rack. 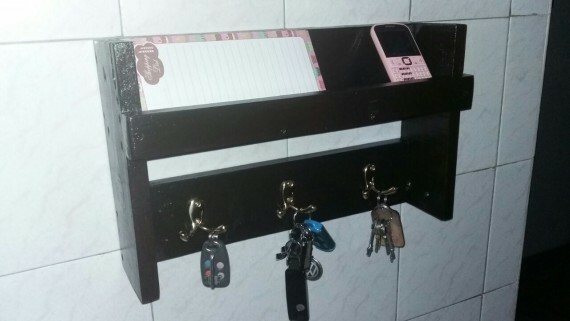 As you can see here in the pictures, its design is pretty classic where you can not only place your keys on some specified hooks, but you can also place some tiny accessories like your cell phone or some utility bills on its upper rack so that you may find them very easily when you are going to leave the house. 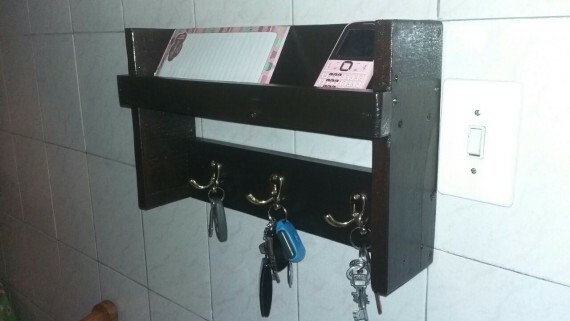 The entire structure of this key rack is made by upcycling the pallet wood and nothing else. Though this is stained in dark brown to match it to the rest of furniture.